Clean and elegant lines. Love this bed! Beautiful details are plentiful in the charming Anchor Bay collection. A crown-cap silhouette is enhanced with button tufting and linen-like fabric. Pinstriped upholstery and dark brown wooden legs make this collection both current and timeless. Whether you're by the sea, or just dreaming of being there, the Anchor Bay collection is sure to be the centerpiece of your elegant bedroom. • We love how the Anchor Bay upholstered bed brings a little coastal style in cream to your bedroom space. • The Anchor Bay upholstered bed comes in your choice of navy or cream and full, queen, king or cal king. • Engineered to be easy to care for so you can spend time on more important things. •Makes everyday life a little bit easier with features like center supports and durable upholstery. 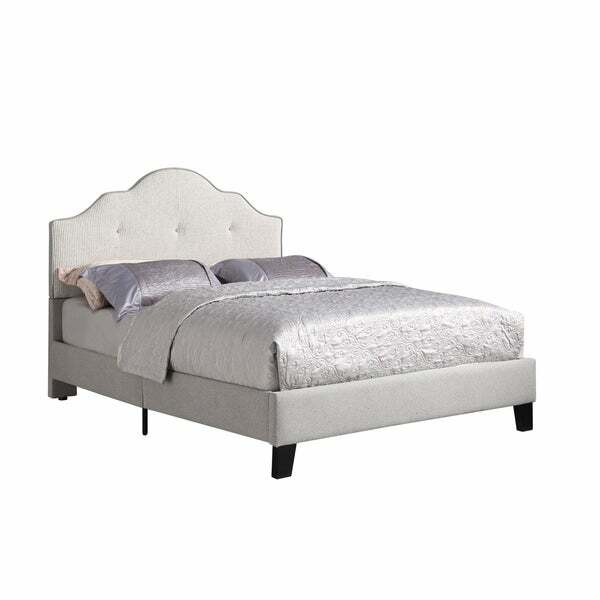 •This bed was designed to be used with a low profile box spring or foundation to achieve the look of a platform bed. This product will ship to you in one box. Note: This product will be shipping using Threshold delivery. The product will be delivered to your door of the nearest ground-level entrance of your residence. Signature required upon delivery. Dimensions 64.5 In. X 33.8 In. X 6.3 In.